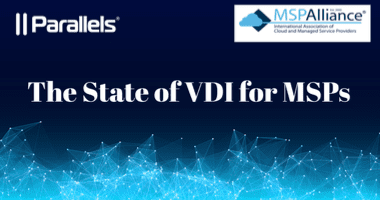 VDI for MSPs – Over the past decade, IT service providers have had their world rocked by the rapid expansion of mobile platforms and virtual desktop infrastructure (VDI) technology. Suddenly, their customers’ employees expect access to virtual workspaces on any device, anywhere—and managed service providers (MSPs) are taking note. MSPs can find it expensive and complicated to enable mobile devices to access IT resources. Tasks such as scaling up and down resources and delivering enterprise applications on mobile platforms or across various desktop OS can present logistical challenges. Furthermore, their customers expect seamless service at a competitive market rate that fits within their predetermined IT budget. To meet their customers’ expectations, MSPs are turning toward affordable, all-in-one VDI solutions. VDI solutions provide a secured and managed service to desktop and mobile users anywhere. With an end-to-end VDI solution, MSPs can help their customers meet real business problems, such as supporting employee mobility and speeding up roll outs of new software and enterprise resource planning (ERP) systems. For MSPs, it’s important to understand how to position VDI as part of a broader business solution. For MSPs, one of the profitable VDI-based opportunities is known as Desktop as a Service (DaaS). In the DaaS model, MSPs are able to establish recurring, reliable revenue streams by providing virtual applications and desktops to their customers over the cloud. Rather than managing desktop OSes on dedicated computers, DaaS delivers remote access to shared virtual desktops and corporate data on any device or OS platform. n installing applications and OSes on individual machines. In the mobile era, employees now expect mobile capability that allows them to efficiently complete their work from any device. By providing DaaS-powered virtual desktops on the cloud, MSPs can offer clients access to their desktops and data from anywhere, anytime, and from any device. Makes it easy for your customers to implement bring your own device (BYOD) policies. Creates a more centralized interface to manage customers’ desktops, business-related software updates, and troubleshooting. Strengthens security infrastructure to protect corporate data from malicious users. Reduces IT support time for desktop management tasks. Boosts productivity among your customers. Want to learn more about how VDI can help you provide a better service to your customers? Join the webinar State of Virtual Desktop Infrastructure (VDI) for MSPs presented by Parallels and MSPAlliance on June 14th at 10:00 a.m. PST.